Three years ago, I published a small plugin both on GitHub and in the plugin repository that made it possible view WordPress page templates in the admin. 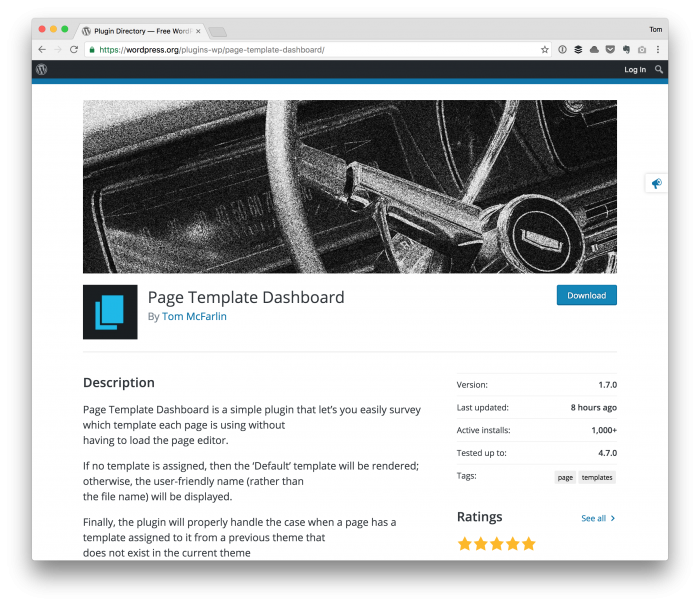 I called it Page Template Dashboard – naming things isn’t easy, and even when you do, it’s obviously not great – but WordPress has changed a lot in three years. Remember when WordPress looked like this? In three years, a lot can change in your personal life too, and this makes it hard to work on personal projects. But when you can steal a few hours – usually late at night – it makes it possible to revisit and update projects like this. So last night, I release the latest version of Page Template Dashboard. An easy way to see which templates your pages are using without having to view the page editor. otherwise, you will see ‘Default’ listed. You can grab it either from GitHub or from the WordPress Plugin Repository with freshly minted graphics assets (not that I’m a designer, but it’s a shot better than what’s above, right?). 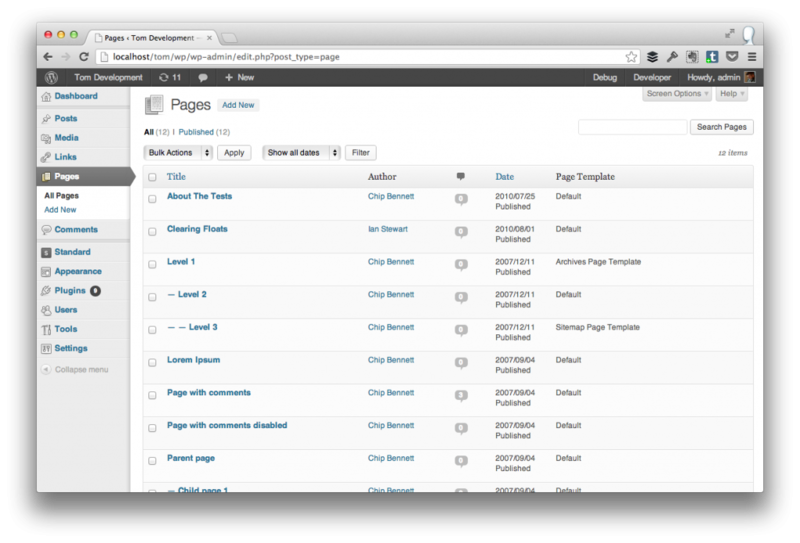 Page Template Dashboard in the refreshed Plugin Repository. I’ve tried to make this as easy as possible to use (though feedback is always welcome) and it includes bother user and developer-centric features. To get up and running with the plugin, you can either download the plugin from within the WordPress itself (by searching for it), or you can download it from the page above. A single additional column added to the admin. Once installed, it “just works” in that there are no options to configure. The new column is added when the plugin is active and removed when the plugin is deactivated. Page Template Dashboard includes composer.json so you can download the plugin to your local development environment, install the PHP CodeSniffer, and then work on the plugin using whatever rules you prefer. the code was brought up to the WordPress Coding Standards. I don’t necessarily consider this a plugin that’s useful for developers. But for those who want to grab a copy of it, open issues, fork it, add a pull request, or any of the above, you can grab it on GitHub. When it comes to plugins like this, I usually don’t maintain roadmaps; however, if there’s additional feedback then I’m happy to take a look at it. I usually don’t pay attention to the built-in forums in the Plugin Repository (and I have a policy for that! ), but I do pay attention to all emails and notes on GitHub. Finally, if you’re a fan of this plugin or feel generous, I’m always grateful for those who feel so inclined to share its repository page on networks like, you know, Twitter. It’s fun to work on these, and a few people do use the plugin. But plugins tend to slowly die and interest wanes when it’s more or less forgotten amidst the thousands upon thousands of plugins available. I like the picture of the dashboard for your Dashboard plugin. Is that an old Cadillac dashboard? Indeed, but I can’t take credit for it. It’s a license-free (or basically permission use as one want license :) image. The first one I looked at was even more vintage, but it wasn’t really kept up, and I didn’t want to use a header image of something busted for a plugin. Seemed a little opposite of how I want things to be perceived ;D.
This is a slick little plugin. 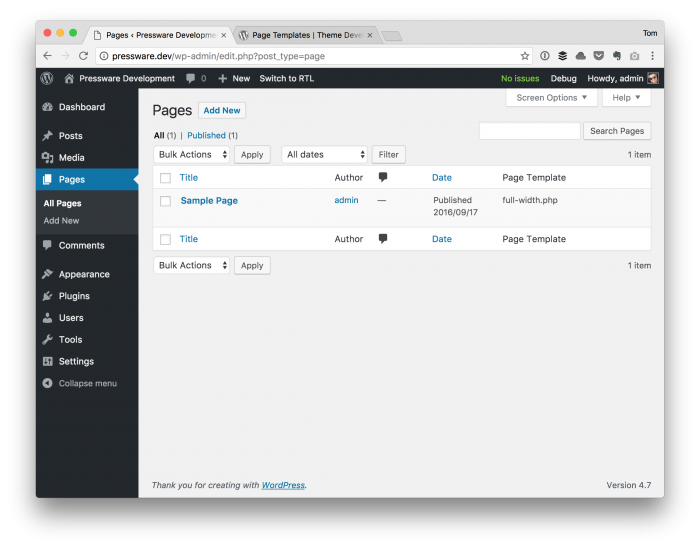 Now that WordPress 4.7 supports page templates for all post types, any thoughts on expanding it to add page template columns to those screens as well? I’d be happy to help with that nugget over the winter break, would be a fun contribution to work on over eggnog by the fire. any thoughts on expanding it to add page template columns to those screens as well? Eventually, yes. I’ve had some others ask for this but it takes me a little while to get to the free plugins I already manage that it’s one of those things that I can add to the backlog of things I’d like to do. I can’t promise when they’ll get done. Nice plugin…I use something similar called What the File? Have you used it? It shows the file names when you are actually browsing the site from the front-end and logged in as admin. Nice plugin…I use something similar called What the File? Have you used it? Thanks! Not, I’ve not used that plugin before. It shows the file names when you are actually browsing the site from the front-end and logged in as admin. That sounds cool – not a bad idea at all :).